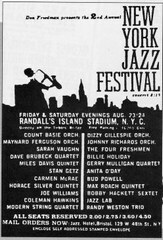 Second Annual New York Jazz Festival, Festival was held on august Friday 23 and Staurday 24, 1957. 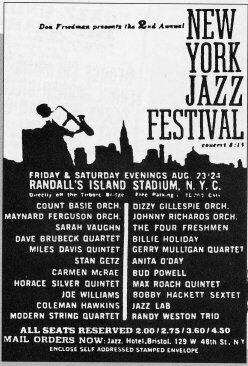 Other musicinas that appaeared during the festival include J.C. Higginbotham, Johnny Richards Orchestra, Gigi Gryce-Donald, Byrd Jazz Lab, Randy Weston, Bud Powell, Max Roach Quintet en Anita O’Day, Dizzy Gillespie Orchestra, The Four Freshmen, Gerry Mulligan Quartet and Bobby Hacket Sextet. 9 songs were performed of which 3 unknown. 1 Nice work if you can get it UN - - ? 2 God bless the child UN - - ? 3 Too marvelous for words UN - - ? 5 Lover come back to me UN - - ? 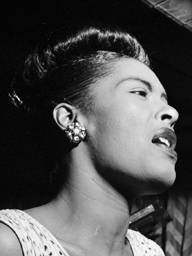 6 Lady sings the blues UN - - ?